We have talked about it before, but chances are you have gotten dehydrated at least once since the seasons have changed. You feel thirsty and tired, your head aches, and you realize it's been an awfully long time since you visited the bathroom. This is when you know to reach for a water bottle immediately. 1. You are constantly losing water from your body through urine, sweat, stool, even from water vapor in your breath! And if you do not replace those fluids, you can end up dehydrated. 2. Water plays a crucial role in your body. It lubricates your joints and eyes, keeps your skin healthy, and aids in proper digestion. 3. 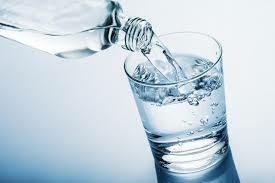 Chronic, mild dehydration can cause constipation. Water helps move smoothly through your system: when there is not enough of it your stool gets compacted, making it harder to eliminate. Remember, you are only as healthy as your COLON! 4. Dehydration can also lead to weight gain. When you are thirsty, your body can misread the sensation as hunger, causing you to overeat. 5. Chronic dehydration can also lead to poor kidney function and kidney stones.